At the beginning of every school year a lot of us get a new assignment notebook, thinking we’ll stick to it religiously and keep careful track of our schoolwork in it every day. But as the second half of the school year begins, I think a lot of students are looking in their notebooks and realizing they haven’t been sticking to it as closely as they intended. That’s okay! Really, it is! But we still have to keep track of due dates and test dates somehow, and it turns out that you can do it just as easily (if not more easily) with something that you probably already carry around with you wherever you go: your phone. 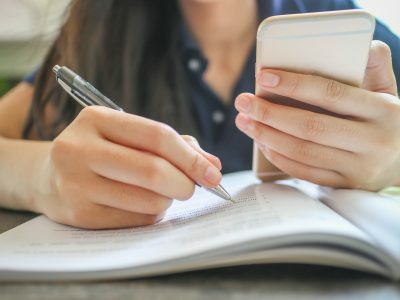 A smartphone, even a very basic one, can be an incredibly useful tool for getting your study schedule on-track, and you don’t even have to spend any extra money to do it! For example, there are plenty of free apps out there, from myHomework to Wunderlist, that can help you get your ducks in a row, and Google Calendar comes pre-loaded on a lot of phones as well as being available for both Android and iPhone. Whichever app you choose, here are some ways to make sure you get the most out of it and stay organized! It’s easy to write down an assignment on the day it was given, but that only really works well for homework that’s due the next day. You need to use a different system to make sure you remember not only those short-term assignments, but the longer-term ones as well. Fortunately, the solution is simple: write down the assignment info in the space for the day it’s due, not on the day it was handed out. Fortunately, calendar apps make it super easy to do this, and they display your agenda in different formats over different periods of time so that you always know what’s coming up! Similarly, tests are often announced well in advance of when they will actually be given, so it’s important to keep those dates recorded in your calendar as well. Always knowing when you have a test coming up is a crucial step in making sure that you’ve given yourself enough time to study for it! Getting notifications from your calendar app can be super annoying, but instead of just turning them off you should try to find a way to make them work for you. Sure, it’s not helpful to be notified of a test when you’re just about to take it, but try changing a few settings. Let’s say you like to give yourself two days to study for a test – just set the notification to warn you about the test two days in advance, and you’ll never forget to start studying! After a long week of school, it’s tempting to just veg out and try not to think about your responsibilities. I mean, that’s basically what Friday nights are for. But on weeknights and the weekend, there’s a lot of free time and you’re probably being given a lot of homework to fill it with. Especially if you already have your schedule for school in your calendar app, why not make a schedule for your homework time? In addition to making sure that you remember to do your homework, it can help you get the homework done quicker. That, in turn, means more free time for you after you’re done!